TWO BAR MITZVAHS is LIVE! We are thrilled to share that TWO BAR MITZVAHS is live at Amazon, Barnes & Noble, Kobo, and iTunes! Be sure to check out all the goodies below. There are buy links, a scorching TWO BAR MITZVAHS excerpt, and a giveaway for a $25 gift card and a signed No Weddings Series book set! And a huge thank you to Inkslinger PR and all the participating bloggers for helping with today’s Two Bar Mitzvahs Release Day Launch. We appreciate all that you do. 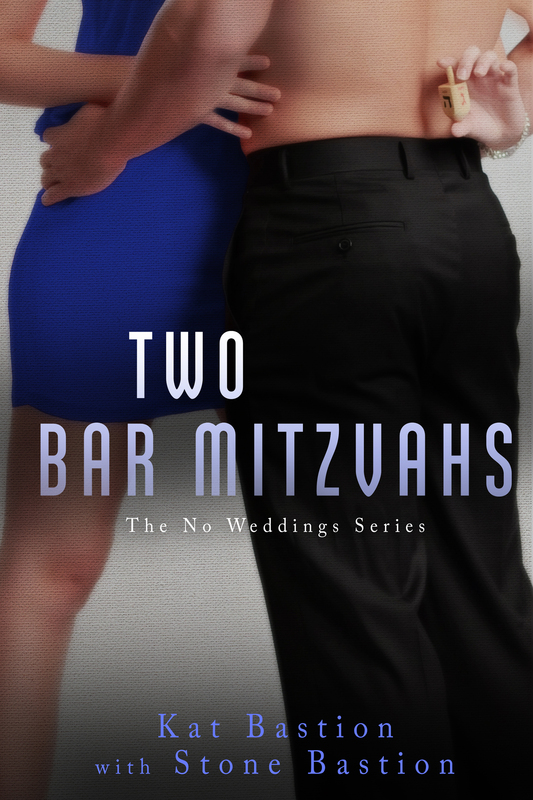 It’s release day for Two Bar Mitzvahs, the second book in Kat and Stone Bastion’s No Weddings Series. There is a special price AND you can get the digital copy signed for today only!!! Digital copies have promotional pricing of $0.99 and are signed on release day only. We look forward to continuing Cade and Hannah’s adventures in the No Weddings Series with you. Thank you for all your amazing support. We greatly appreciate it. This entry was posted in No Weddings, No Weddings Series, Romance and tagged 99 cent ebook, 99 cent Kindle, 99 cent romance, Amazon bargain, Amazon bargain book, bargain, bargain eBook, bargain Kindle, coming of age romance, contemporary romance, holiday romance, holidays, InkSlinger PR, Kindle, Kindle deal, Kobo, male point of view, male point of view romance, Male POV, male POV romance, New Release, new romance release, new romantic comedy release, No Weddings, No Weddings Release Day Launch, No Weddings Series, One Funeral, party planning, party-planning romance, release-week promotion, romance, romantic comedy, romantic comedy series, series, Two Bar Mitzvahs.